The Hargraves, a kind but scrawny family, want their new baby to grow up big and strong. But the tiny tyke will hardly eat a thing. One day, Mrs. Hargraves finds an avocado in the fruit bowl, and the infant gobbles it up. But then, the strangest things begin to happen as the baby develops superhuman strength. Just the book for picky eaters. "Amusing for adults, impressive for toddlers, good for greengrocers." "Amusing for adults, impressive for toddlers, good for greengrocers." --"The Observer"
5.0 out of 5 stars"Why don't you give it that avocado pear..."
And the rest was history :) I love this book. It was one of my favorite and most memorable from childhood and got me loving avocados (so healthy) from an early age. I recently purchased for my expecting sister. Buuuuut, it has some edgy themes I was surprised by in a recent reading: namely bullying & robbery. I don't think many would give it a second thought in the 80's (we had cigarette vending machines goddammit), but today...it will raise an eyebrow for some. Not trying to perpetuate overly PC, trigger-warning, Safe Zone thinking...I'm a semi-pro athlete that loves 'locker-room talk'. Just saying. I still love this book and while it has its imperfections, it sits comfortably in my top ten kiddo books. 5.0 out of 5 starsHilarious and educational children's book about healthy food! 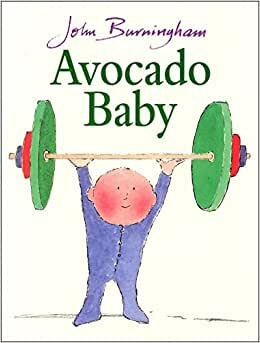 Avocado Baby by John Burningham is a hilarious book about a family expecting a baby. The family, the Hargraves, are afraid their new baby will be weak, like the rest of the family. When the baby is born, he is fussy and won't eat. The mother is at her wit's end. Then, one of the other kids suggests feeding the baby an avocado. The mother gives it a try and the baby is suddenly super-strong - fending off burglars and bullies - even throwing a bully in a lake! My 5-year old and I both laughed out loud at this one. He wanted to read it over and over again, laughing every time. It's one of his favorites. 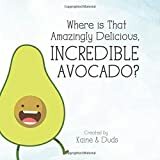 My son already loves avocados, but I can imagine this book would convince any picky kid to give avocados a try. 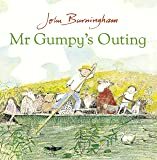 I hope John Burningham will write more books about the power of healthy fruits and vegetables! I bought this as a joke for a new mom who loves avocados. It’s actually a really cute story. This was my little sister's favorite book when she was a child. She found it in the school library when she was about 6, and she must have checked the book out a hundred times! Back then, of course, we didn't have the internet, so my mother couldn't find it for her. When she had her baby last year, I bought this book for the new baby, as sort of a reminiscence of my sister's childhood, and to sort of signify something that they could share from one generation to the next. My sister was so thrilled when she unwrapped the book! It's hilarious, adorable, and very, very sweet!!! 5.0 out of 5 starsFun for the baby. Mother-in-law gave this to my baby son and she was so excited to get this for him. Does have British lingo, which makes it interesting.